Police were called to an incident at Paddington Station in London at the weekend, when a 28-year-old man was arrested for urinating in a public place - the Gentlemen's conveniences located on Platform 1. Guy Court, 28, was apprehended shortly after leaving the toilets, by officers who were alerted by the eagle-eyed CCTV security monitors whose job it is to analyse public activity there. The toilets were taken out of commission as 'toilets' in 2016, and were redesignated as 'Specialist Toilets' in 2018, after it was found that shady people of all sexual backgrounds were frequenting the location at night. Each cubicle has a small 2-inch hole drilled through its sidepanels for 'Glory Action'. "I wasn't doing anything wrong. I was only having a piss." "Times have changed. This is not the place for that sort of thing. 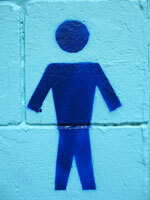 If someone wants to take a piss, there are plenty of shop doorways nearby."